The longear sunfish, Lepomis megalotis, is a freshwater fish in the sunfish family Centrarchidae of order Perciformes. It is native to the area of eastern North America stretching from the Great Lakes down to northeastern Mexico. The longear sunfish reaches a maximum recorded length of about 9.5 in (24 cm), with a maximum recorded weight of 1.7 lb (790g). Most do not live beyond six years. The longear sunfish is quite colorful, with an olive to rusty-brown back, bright orange belly and blue-green bars on the sides of its head. A unique characteristic is their elongated opercular flap, giving an appearance of a “long ear”. The species prefers densely vegetated, shallow waters in lakes, ponds, and sluggish streams. Its diet can include insects, aquatic invertebrates, and small fish. Avoiding strong currents, longear sunfish are usually present in small to moderate flowing streams, rivers, and reservoirs. The genus Lepomis has a well-characterized mating behavior where parental care is done by the male. He makes and defends the nest. Males fan the eggs to remove silt and other debris until the larvae hatch. Some longear females produce 4,000 eggs. They spawn in groups but do not form large colonies. 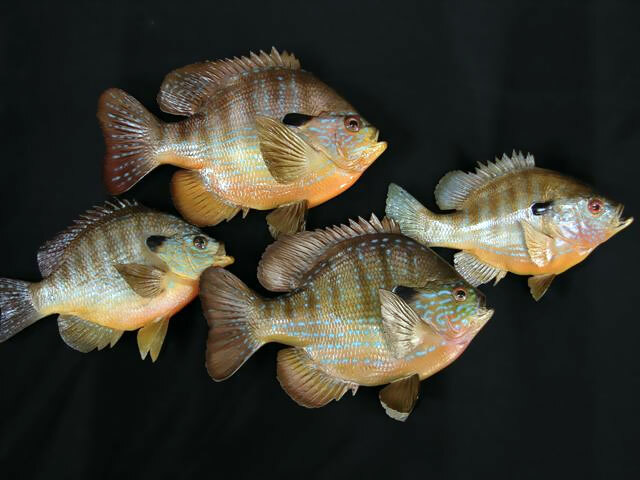 Longear sunfish are better at getting food in moving waters than still waters. This may explain why they are more abundant in streams than lakes. For the most part, longear sunfish are active during the day and inactive at night. There are very few conservation acts currently being performed in order to maintain the distribution and abundance of this species.